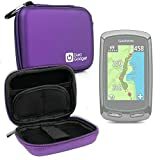 High quality, compact purple hard case for the ultimate protection of your Garmin Approach! Introducing DURAGADGET‘s new rigid zip case for your Garmin Approach. With a soft, felt lining and durable outer shell, this case provides maximum protection for your device. The executive looking case features a sturdy dual zip-closure to the main compartment, lending extra security and ensuring your smartwatch is kept dust and scratch free. Equipped with a handy mini carabiner, you can easily keep your device close by when you leave your car or house, providing added versatility and choice in the transportation of the gadget. An inner elasticised strap will keep your important wearble gadget firmly in place. This sleek case is finished in vibrant purple, so you can transport or store your precious device in style.